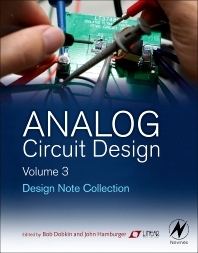 Design Note Collection, the third book in the Analog Circuit Design series, is a comprehensive volume of applied circuit design solutions, providing elegant and practical design techniques. Design Notes in this volume are focused circuit explanations, easily applied in your own designs. This book includes an extensive power management section, covering switching regulator design, linear regulator design, microprocessor power design, battery management, powering LED lighting, automotive and industrial power design. Other sections span a range of analog design topics, including data conversion, data acquisition, communications interface design, operational amplifier design techniques, filter design, and wireless, RF, communications and network design. Whatever your application -industrial, medical, security, embedded systems, instrumentation, automotive, communications infrastructure, satellite and radar, computers or networking; this book will provide practical design techniques, developed by experts for tackling the challenges of power management, data conversion, signal conditioning and wireless/RF analog circuit design. Electronic design engineers; analog designers; engineering students; electronics hobbyists (advanced). Bob Dobkin is a founder and Chief Technical Officer of Linear Technology Corporation. Prior to 1999, he was responsible for all new product development at Linear. Before founding Linear Technology in 1981, Dobkin was Director of Advanced Circuit Development at National Semiconductor for eleven years. He has been intimately involved in the development of high performance linear integrated circuits for over 30 years and has generated many industry standard circuits. Dobkin holds over 100 patents pertaining to linear ICs and has authored over 50 articles and papers. He attended the Massachusetts Institute of Technology. John Hamburger directs global marketing communications programs at Linear Technology, where he was instrumental in developing the Analog Circuit Design book series. Previously with Luminous Networks and Terayon Communication Systems, he helped define marketing strategy from startup to public company, and held positions with Cypress Semiconductor and AMD. Prior to his career in high tech, he was an editor for Addison-Wesley, Harper & Row, WH Freeman, Harcourt Brace, Stanford University Press, and Runner’s World. He holds a degree from the University of Chicago.